Well, the above photo says quite a lot about the weather this last week!! 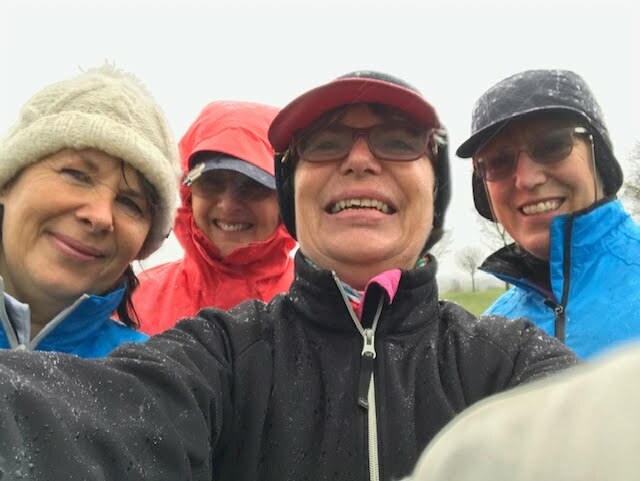 The Tuesday match was wiped out completely by persistent rain and strong winds, though some very brave ladies did venture out!! Thursday was really no better! Kathy C took this photo of herself, Maggie, Mandy and Caroline, its a wonder they were still managing to smile!! The Price Vase, as you are all aware, had been competed for in terrible weather over both the two separate days. Scores were very mixed throughout but coming out on top this year was Linda B with an impressive score, considering the weather, of 33 points. Runners Up were Anne L on 31 points and Pauline H on 30 points. A huge well done to all the ladies that took part in the two days. Lets hope the next competition, held in this way,(Ann Warner/Maureen Eastwood Trophy on 20th April - Easter Saturday and Thursday 25th) will have much better weather! To finish the week off, Sunday bought the Ken Bird 4 Ball Betterball Bogey Mixed Match. Again the weather was terrible where I was, with hailstorms followed by sunshine! At the point of publishing this, the results have not been published, but if you played again, you certainly deserve a medal. Roll on some decent weather! With my plans of finally playing in a full competition last Tuesday thwarted yet again, I am still to play 18 holes of golf since before Christmas!! Heaven help the team of 3 who have me as the 4th player this coming Thursday for the O'Sullivan Cup! After the match on Thursday, we will be drawing the matches for the pairs and singles summer knockouts. If you are involved, please stay behind if you can, to watch the draw and see who you will be competing against in the first round!! Mandy U is kindly organising a morning trip to the Osprey's Outlet Shop near Hatfield, noted for its leather goods, which some of you may have heard of! The trip has been organised for Monday April 1st, leaving Chesfield car park at 9.45 a.m. with the intention of sharing lifts. A very nice Café is on site too for a cuppa and a cake after some shopping. A sign-up sheet is sitting on the general noticeboard with more information, so please do put your name down, so that we have an idea of numbers interested. Finally, after golf last Thursday, many of us joined the family and a huge number of friends for the Service of Remembrance for Kay Baker. The crematorium was absolutely creaking at the seams, with probably over 160 people there, a clear message to the family of how well loved Kay was to so many. The service was really beautiful with carefully chosen words that encapsulated what a special lady Kay was. In memory of her life within Chesfield Downs Ladies Section, her family would like to present a trophy in her memory and I will be talking to the family later in the year about this.